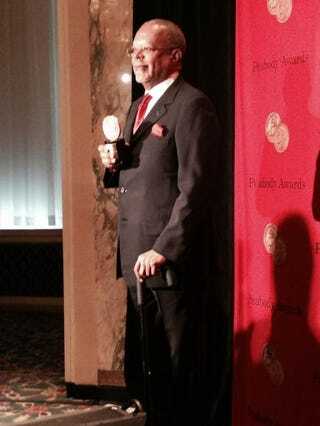 Henry Louis Gates Jr. at the Peabody Awards May 19, 2014, at New York City’s Waldorf Astoria. Storytelling across electronic media was celebrated on Monday at the 73rd annual Peabody Awards ceremony, which took place at the Waldorf Astoria hotel in New York City. Among the recipients of the esteemed award was The Root’s editor-in-chief, Henry Louis “Skip” Gates Jr., who accepted the award for his PBS documentary series The African Americans: Many Rivers to Cross. Peabody Awards aren’t based on categories; rather, they denote excellence in radio, television and the Web, focusing on celebrating stories that are done well and that matter. Other awardees include 180 Days: A Year Inside an American High School—a documentary broadcast on PBS that chronicles life at a high school in a high-poverty section of Washington, D.C.—and broadcast, cable and Web series such as Breaking Bad, Key & Peele, House of Cards, Orange Is the New Black and Scandal.